The purported screenshot shows the Android device to have a 1.8GHz processor, with 2GB of RAM and a 12 megapixel camera. 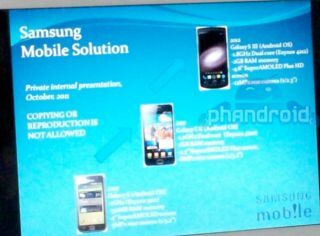 The presentation, allegedly obtained from Samsung Mobile Solutions, also shows a 4.6-inch Super AMOLED Plus HD display. If true, that would be an improvement on the 4.3-inch Super AMOLED screen of its predecessor. Phandroid's source claims that the device is thinner than the Galaxy S2 and, judging by the screenshot, will offer a slightly refined form factor with tapered edges. The tipster also reckons that the Galaxy SIII will arrive running Android Ice Cream Sandwich, which was scheduled to launch on October 11 with the Nexus Prime. Earlier on Monday, Google announced that its planned launch with Samsung was cancelled on Friday as a mark of respect to late Apple co-founder Steve Jobs. "We believe this is not the right time to announce a new product as the world expresses tribute to Steve Job's passing," Google said in a statement. It's not yet known when the Samsung Nexus Prime/Android Ice Cream Sandwich launch will now take place.